As you would expect, the Bob’s Burgers Burger Book is extremely clever. In each episode of Bob’s Burger, there is a different “Burger of the Day” written in chalk on the chalkboard. All of the burgers are named after some sort of pun. For example: “If Looks Could Kale” Burger and the “Onion-Tended Consequences” Burger. This cookbook has pulled together 75 of those same burgers and shared a delicious recipe for them. As the tagline of the cookbook says: Real Recipes for Joke Burgers. 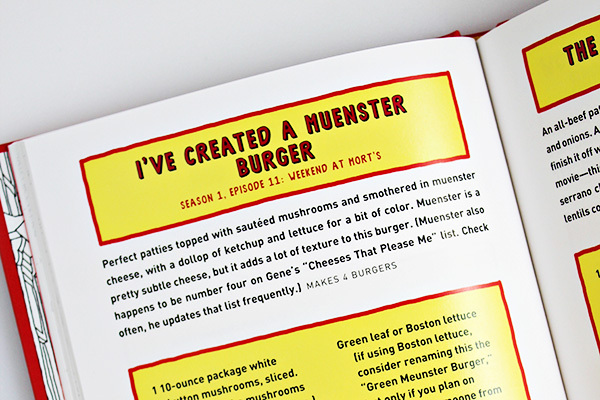 Sure, they may have started as jokes, but thanks to Cole Bowden and his blog, The Bob’s Burger Experiment, the recipes were further developed into this fun cookbook any fan would love. I spent some time reading through The Bob’s Burgers Burger Book and had a hard time deciding which one to make first. But I knew I want to share one with all of you and finally I narrowed it down to the “I’ve Created a Muenster Burger”. I went with this one because it was very simple and, well, selfish reasons: I love mushrooms and I love cheese. I also wanted to try a burger that might be good for Halloween. There is a burger in the book called “The Jack-o’-Lentil Burger”, made with orange lentils. That would probably have been a better one to go with Halloween, but I wanted a beef burger this time around. The “I’ve Created a Muenster” Burger can work. You know, “muenster” = monster. Get it? Also, the “I’ve Created a Muenster” Burger comes from season 1, episode 11, called “Weekend at Mort’s”. Mort is the mortician next door to the restaurant. When Bob’s Burgers get shut down due to a mold issue, the family goes to stay at Mort’s crematory home (which is rather cool & modern). The kids, in typical Belcher Family style, get into some troubles in the morgue when a zombie prank turns them into thinking there is a real zombie in there. So, not a Halloween episode exactly, but it definitely has Halloween qualities. There is two main toppings for the “I’ve Created a Muenster” Burger. There is muenster cheese, of course. 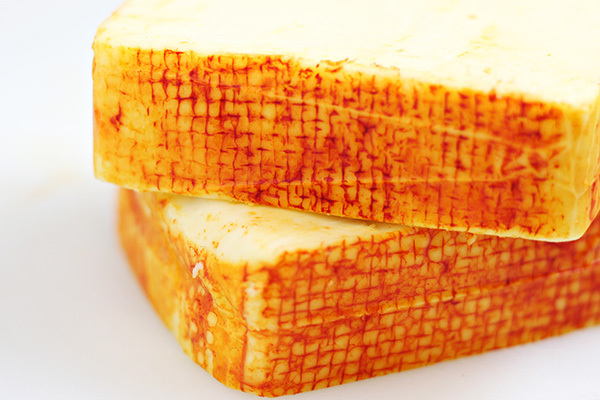 It’s a very mild cheese that melts so beautifully. See the orange edge? It’s perfectly edible. The orange color makes it perfect for Halloween, if you ask me. As you see, I bought my muenster vheese in blocks, since this was all they had at my usual grocery store (Winco). Since muenster is a softer cheese, I would recommend getting a package of pre-sliced Muenster. If you have to buy it by the block like I did, I would recommend putting it into the freezer for about 15 minutes before you slice it. The second star of this burger show is the sliced mushrooms that you saute in a frying pan with bit of butter. I cut my own, but you can make your life easier by buying pre-sliced. There was a few very minor changes I made from the original recipe. One was that we used frozen patties. We also grilled them and grilled our buns just a bit. We also used red leaf lettuce, but that was only because there was only 1 package of green leaf lettuce left at the store and it was super tiny. 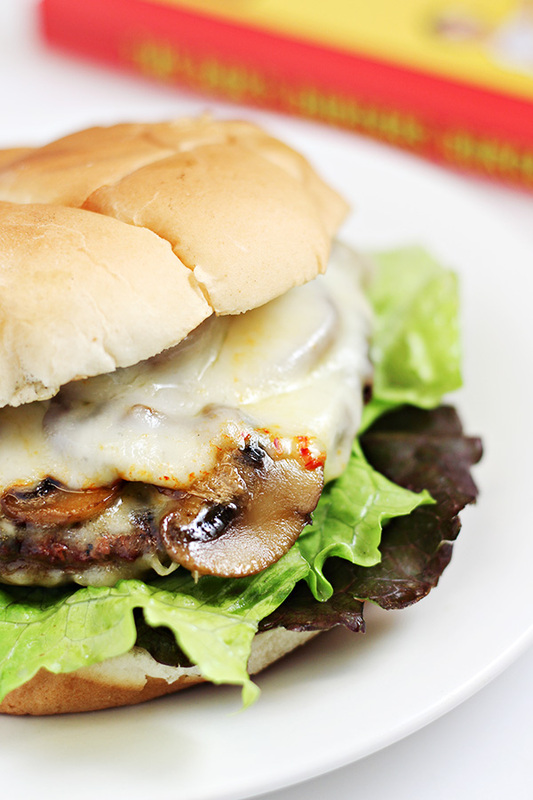 Your beef patty is topped with cheese, then mushrooms, and then more cheese. Also, unlike my photos show, I strongly recommend adding the mushrooms and the top layer of cheese while they are still on the frying pan (or grill) for optimal cheese melting. The original recipe suggests topping with ketchup. Most of the family did this although I left it off for these photos. The “I’ve Created a Muenster” Burger is simple, but it totally works. 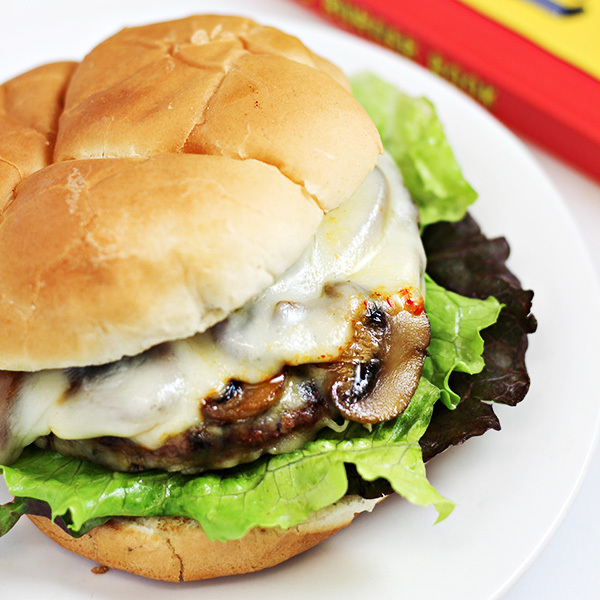 If you love a burger with mushrooms and plenty of gooey cheese, you’ll enjoy this. And if you’re a Bob’s Burger fan, you’ll probably like it even more. 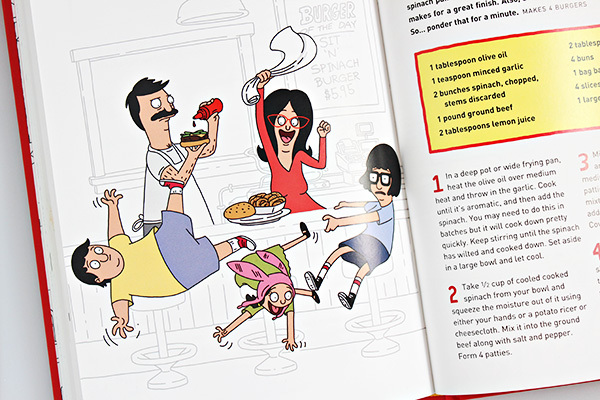 Oh, and the Bob’s Burgers Burger Book also gives instructions for “How To Cook a Basic Burger Best” and “How to Cook Your Own Fries Faultlessly”. Good tips. 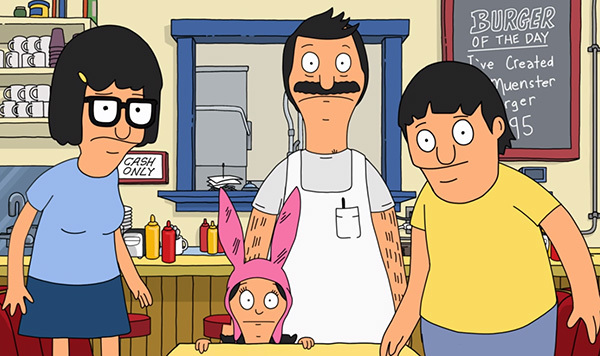 Of course, this cookbook is an absolute MUST for anyone who loves Bob’s Burgers. It’s such a great gift idea and even if the person doesn’t make the recipes (which I bet they will make at least a few of them), it’s a fun book to read. Melt the butter in a frying pan over medium-high heat. Saute the mushrooms in the butter until they are light brown. Form 4 patties and season both sides with salt and pepper. Cook the burgers for about 4 to 8 minutes per side and until the middle is at least 155 degrees F, but just under 160 degrees F on a meat thermometer (it will continue to cook after it is remove it from the heat). Turn off the heat and flip the burgers one last time and place one slice of cheese on each burger. 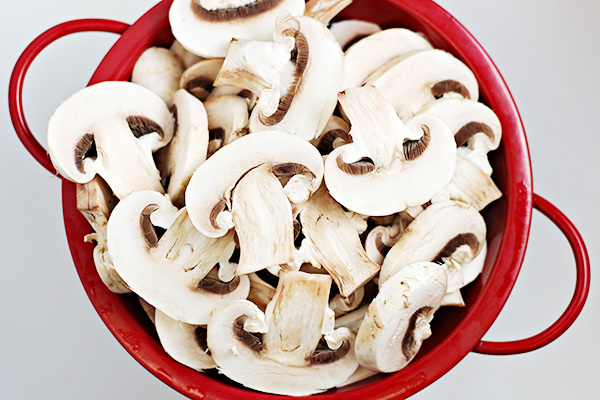 Then pile ¼th of the mushrooms on top of the cheese and then top with a 2nd slice of cheese. 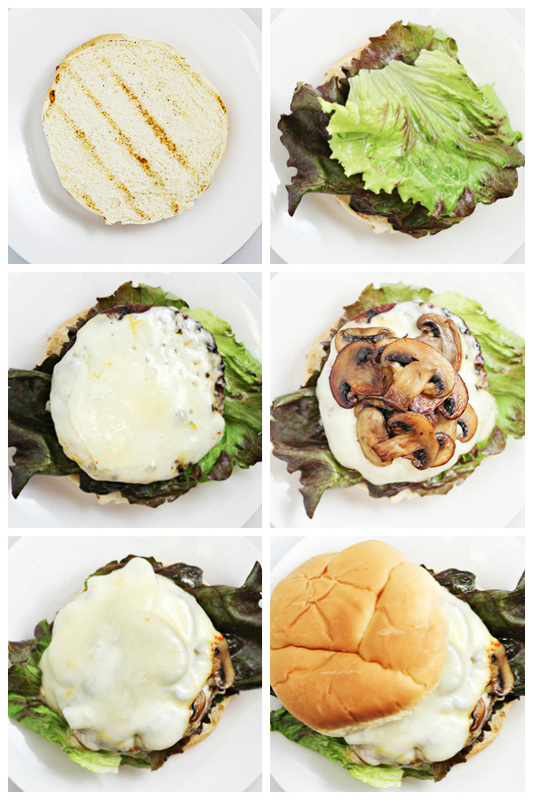 Build your burgers by placing a bottom bun on your plate, then lettuce, followed by one of your burgers. Top with ketchup, if you wish, and finally the top bun. Enjoy! If using frozen beef patties, follow the instructions on the packaging. For the burger photographed in this post, I used frozen beef patties which were grilled, red leaf lettuce, and no ketchup. The bun was also toasted on the grill. What a great looking burger. Pinned! Omg I love Bob’s Burger I didn’t know they had a book of recipes out! I will have to try this but with turkey since I dont eat beef. I’ve heard of this show, but wasn’t sure what it was about. I’ll have to check it out! The burgers sound delicious!! Thanks for sharing at the family joy linkup! Not only the does the burger look great – what a fun post! Thanks for sharing on the What’s for Dinner link up and don’t forget to leave a comment at the party – Next week’s features that also leave a comment get pinned and tweeted!